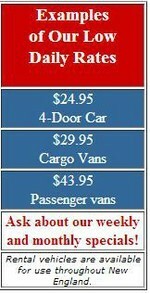 Tony's Garage Offers On-Site Auto Rentals Low Rates Available by the Day or Week. Tony’s Garage Offers On-Site Auto Rentals Low Rates Available by the Day or Week. Need to rent a car? Tony’s Garage has clean dependable and well maintained vehicles for rent. All of our rentals are maintained by our fully trained mechanics. Serving Storrs Mansfield, CT and All Surrounding Areas.